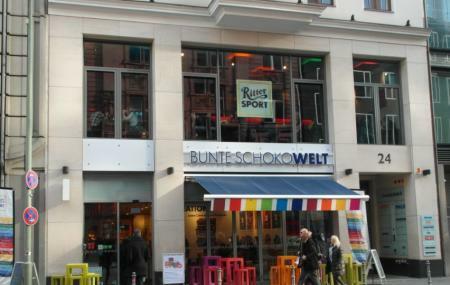 Find hotel near Ritter Sport Colorful Cho .. This attraction is a complete must-visit for any chocolate lover. If you are into chocolate and you are trying to resist, even passing by this place would make you get lost in the beautiful aroma of different types of chocolates that would invite you in. There are 3 floors filled with various kinds of chocolates put up for workshops, exhibitions, consumptions and sale. A complete 1000 square meters filled with the enticing scent of chocolate in every nook and corner. You can even attend a workshop or simply learn more about your favorite item through exhibitions. There is a lot for you to explore over here and take back with you. The kitchens at the ChocoLounge and the ChocoLateria close 1 hour before closing time. For the timings of the workshop, visit the official website. How popular is Ritter Sport Colorful Chocoworld? People normally club together Friedrichstrasse and Neue Wache while planning their visit to Ritter Sport Colorful Chocoworld. These is your must stop in Berlin if you like Ritter Sports chocolates.. they have a vast collection of the chocolates and different mix packs for travelling. They also prepare the chocolate as you like with the ingredients you wanted to add to your chocolates and there is also cafe on the first floor for the breakfast and different shakes to choose from. If you are a chocolate lover and like to taste different flavours of chocolate it is the most recommended place in Berlin. It's more or less what you would expect: A large shop for Ritter Sport. You can buy from the shop asumingly any type of chocolate that they offer or create and order your own toppings. Large bags with "close to due time" chocolate can be bought for a lower price. The top floor features a cafe. Fun place to create your own flavor chocolate from many choices. The coffee place is a sin due to all that delicious sugar treats...ahhh...stay away or enjoy your sins. The chocolate mouse was very nice, even I expected a bid more taste sensation variation since it is a hallmark Ritter Sport store. We spent a pretty penny and still had to pay for a bag really?!?! This is the Ritter Sport Chocolate Museum and Cafe. It shows you the history of the Ritter brand, the products that they sell, and several items with their brand. They also serve hot and cold drinks in their cafe lounge area at the top floor. You can also find limited edition flavours of the chocolate at this store. If you're the least interested in chocolate, this is the place for you. Plenty of discounts on many Ritter varieties. The option to create your own chocolate bar is an interesting feature but would benefit from more ingredients to choose from.